This course is an instructor-led, lab-based, hands-on course offered by Cisco Learning Services. 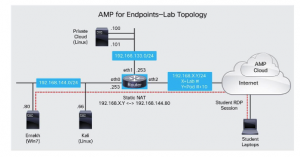 It is a lab-intensive course that introduces students to the powerful features of Cisco AMP for Endpoints software. Day one of this 3-day virtual class covers modern threats, vulnerabilities, and Cisco Advanced Malware Protection (AMP) technologies. Days two and three detail the Cisco AMP for Endpoints product architecture and how it can be used to protect against malware.